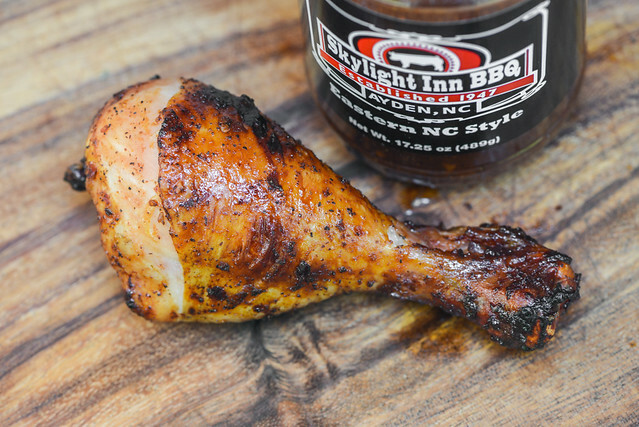 Skylight Inn BBQ delivers the spicy tang you'd expect from an Eastern NC sauce, but adds in a few extra layers and complexity of spices that makes it really stand out. Since moving to North Carolina just over two years ago, I've eaten a lot of barbecue, but haven't really done any pilgrimages. This changed over the summer when I took a worthy detour on a road trip to stop at Skylight Inn in Ayden. Pete Jones started this Eastern North Carolinian institution in 1947 at the age 17, smoking whole hogs over a live fire. Skylight Inn was put on the national map partially thanks to National Geographic dubbing it some of the best barbecue in country. Drawing more attention and folks from all over after that, Skylight Inn added their ubiquitous dome to the restaurant to give them a look fitting of being the "capitol of barbecue." Not much has changed at Skylight Inn over the years—hogs are still slow smoked over a wood fire, chopped with cleavers along with the crisped skin, and served with flat cornbread by the Jones family (although Pete passed away in 2006 and the tradition is now carried on by his nephew Jeff and grandson Sam). 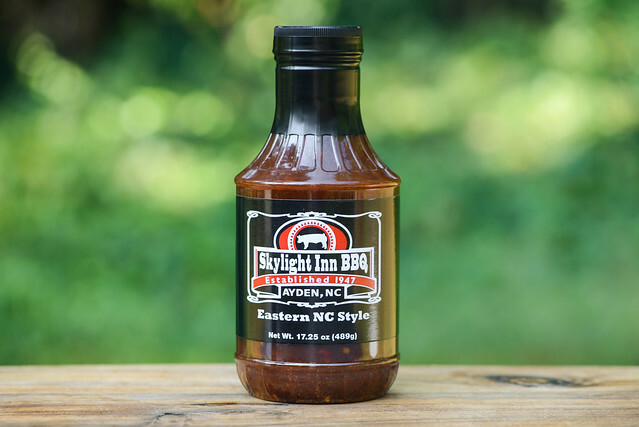 While I was at Skylight Inn, I couldn't help but pick up a bottle of their Eastern NC style vinegar sauce to give a try at home. A big nose-full of hot vinegar greats you on first whiff of this sauce. The strong tanginess dominates, with a very heavy earthy and spicy pepper having a pretty equal presence. There's almost no sweetness to be had in the aroma, but there's surprisingly a mellow acidic tomato despite Eastern-style sauces usually being devoid of that ingredient. This rusty orange sauce is glossy and semi-opaque. This makes it easy to see the tons and tons of red, black, and white spices that come in all shapes and sizes from small specs to large whites seeds. The sauce's consistancy and very thin and watery, which has it falling in an immediate, very fast, and steady pour from a suspended spoon. In just a second or two, all sauce releases from the silverware, with none left clinging, save a few pieces of spices here and there. An initial tangy start gains a bit of balance from a mild sweetness followed by some fruity tomato depth when the sauce first hits the tongue. Any sugars are quickly overtaken though by a strong vinegar that ramps up the tang factor from mild to heavy in no time. There's a slight taste of tomato that remains as the peppers kick in, beginning a mellow earthy heat that becomes a mouth tingling burn by the time the sauce has left the tongue. This leaves an aftertaste that's a double dose of burn—pepper and vinegar. While Eastern NC-style sauce is meant for dressing, not cooking, I still put it through the grilling test. I wasn't expecting much as the sauce looked like it was sliding right off the chicken, but after a few brushings over indirect heat, the leg picked up a light orange hue and a visible spice coating. Over direct heat there was no burning or burn off, just a little extra browning of the spices. The intense tang from out of the jar was diminished to a mere mellowness, but the power of the peppers persisted. There was a layered heat that maintained its earthy background but had more pronounced components, with the black and red peppers being distinctly identifiable. I know from the ever growing comments on my take on a North Carolina sauce that there are strong opinions on the presence of tomato and/or sugar in such a recipe, but I maintain a little of both makes it better on the whole, and Skylight Inn's sauce just further proves that in my mind. 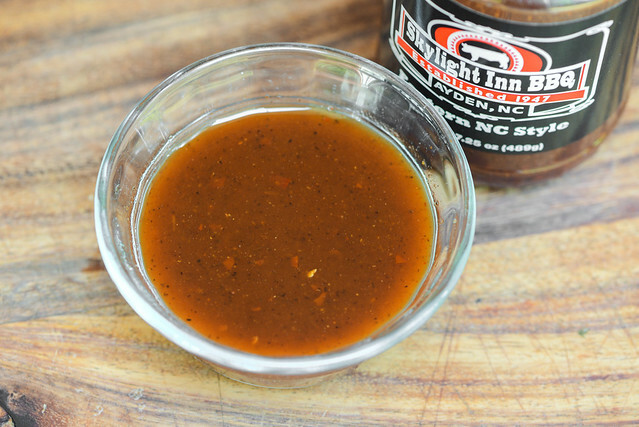 Sure it delivers the intense tang and heat that makes a mild smoked pork really shine, but when tasted on its own, the small amounts of sugar and tomato give the sauce more body and complexity that doesn't distract from its true Eastern North Carolina character. As a fan of spicy, this Skylight Inn sauce hooked me with its variety of peppers, creating a complex and layered heat that gave it a barbecue sauce character, rather than tasting just like a hot sauce. The sauce even surprisingly worked on grill, creating a spice layer that I think would taste great on wings, especially if they were finished with an extra coating of sauce right before serving. This still doesn't take away the primary use of sauce like this though—whole hog!